About This Painting: Santa and the elves kick back and enjoy the sunshine, But it is a new year and time to get in shape for Christmas 2012. All those cookies have added a few pounds so a little muscle pumping on the beach is needed. This is a 5x7 oil painting and painting it Alla Prima with so many figures was very difficult. Today I started with a RayMar panel that is 8x10. I tone the canvas with a wash of orange and transparent red oxide. I wipe most of the paint off with a paper towel and let it dry. I mix a sketching mixture with dioxazine purple and red iron oxide. I establish the horizon line and put little dots where I want the end of my tree branchs to be. I block in some general shapes. I finish blocking shapes. I create the palm tree shape. I wipe out some of the high light areas on the palm tree and add the local color of the water. I use Ultamarine blue and add white as I get closer to the shore line. I begin painting the sand with a mix of orange and yellow. I add shodow with my sketching mix with more purple added to it. I block in the cloud shapes. I now block in the sky with Phthalo Blue and white. I darken the underside of the clouds with puple and add a little yellow to the water near the shore. I paint the sky cutting around the palm branches. I begin paintng the dark areas of the Palm Leaves with a mixture of alizarin chrimson,transparant red oxide, and olive green. 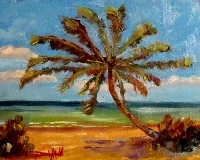 I want the palm tree to be the area of focus so I dull down the clouds a little add high light to leaves of the tree and work a littl more on the trunk of the tree following the shape of the bark with my brush. I deepen the shadows under the tree and nearer the foreground of the painting. Today I am working on a square 6x6 gallery wrapped stretched canvas. I have a series of fish on 6x6 canvas so I want to add a few more to the series. I start with a rough sketch in red oxide. This time I add the background color first because I want the fish to pop out at me and I will work both the background and fish my point of interest at the same time. I start by adding the darks. I can't have lights until I have darks. Now I start building up the color. The fish needs a little reflected light which will come from the top and a small part from the bottom. I begin adding it. I build up the color layers and add more detail. I add accent colors and a few high lights. I did a very quick sketch of the fish and toned the back ground with yellow ochre. This is a RayMar canvas panel that is 8x10. I almost always use RayMar panels for my daily paintings and all of my small work because of the high quality of the panels and the ease of storage. I have started to add dark colors to the painting. Adding more of the local color. When I paint fish I paint from my imagination so it takes me a while to get feel for just how I want the painting to flow. Now I start to add some of the background color. I have decided that I just want color for the background no images such as rocks or weeds. With some of the background in I start adjusting the color of the fish. It's starting to look more like what I want but it still needs more detail. I want the fish to have a little bit of an abstract quality to them.